KATHMANDU, March 19: The price of onions has plummeted over the past week in the Kathmandu Valley. The wholesale price for a kilogram of onion hovered around Rs 33 and Rs 35 last Sunday at the Kalimati Fruits and Vegetable Market. This Sunday, the price went down to an average of Rs 30 per kilogram. The wholesale price of onions in the market was the lowest on Sunday in comparison to the last eight months according to statistics of the Kalimati Fruits and Vegetable Market Development Committee. The average price of onions lower than this was seen last on July 29, 2017 when the price hovered between Rs 25 and Rs 27. 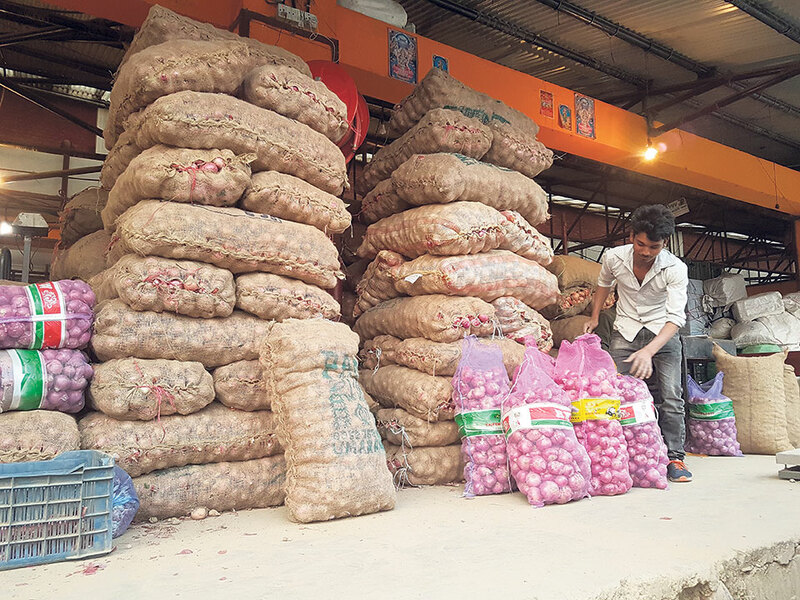 Ram Hari Dahal, an onion trader at the Kalimati market, told Republica: "I have been selling onions for Rs 30 a kilogram when the costumer purchases a 20 kg sack of onions, and this is Rs 4 lesser than the rate I use to sell onions a week ago." Binaya Shrestha, deputy director of the Kalimati market, gave seconds to the claim of Chaudhari. “In recent days, there has been a fall in wholesale price of onions by nearly Rs 5. A majority of onions available in the Nepali market come from India. The supply of onions on this time of the year is usually high in the Indian market causing a plummet in price of onions in the Nepali market following the same across the border in India,” explained Shrestha. The price of onions had reached a year high for the current fiscal year on December 3, 2017 following the decision of the Government of India to hike the export price of onions to USD 850 per ton in order to stop the price of 'politically sensitive' edibles from fluctuating . Likewise the price of onions was the least this fiscal year on mid July when the minimum wholesale price of onions hovered at Rs 23 per kg. With the average wholesale cost of onions dropping to Rs 30 per kg, the cost of onions in the retail market has been set between Rs 40 and Rs 50, which in the beginning of the week was between Rs 50 and 60.